Happy day before Thanksgiving! We've still got some grocery shopping to do in prep for what we're bringing to my parents' house, but before we brave the crowds I have been dyyying to share this holiday look with you. 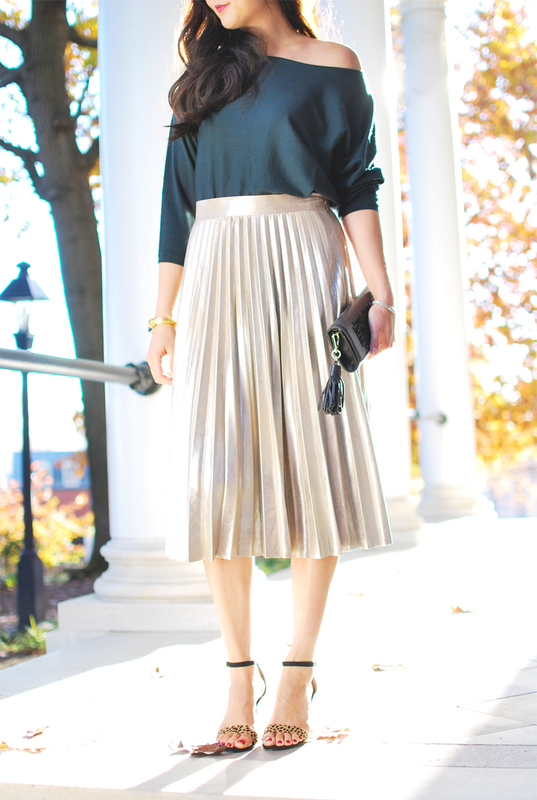 I've been loving the combo of any type of skirt, but particularly the pleated midi skirt, with a sweater. 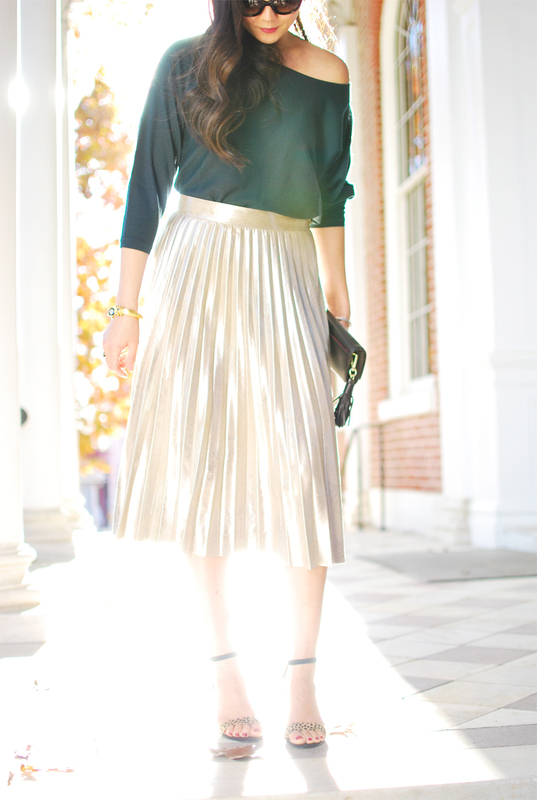 In fact, I was planning on doing an outfit post on a pleated midi skirt with a thicker type of sweater (which I still plan on doing! ), but then when I received this gorgeous Ellie Kai Cashmere Dolman Pullover, I knew it would look great tucked into said skirt for an easy holiday look. Now, I should point out that the pullover sweater is not technically an off-shoulder sweater, but because it's got a pretty wide neckline, I figured why not change it up a bit and put it off the shoulder for a more modern look. I think it adds a bit of sexiness to an otherwise demure combo of skirt and sweater. And to keep me warm and still look luxe for this holiday look, the ridiculously soft faux fur scarf is a perfection addition to this look. I seriously can't stop wearing this scarf! It's so soft and goes with every single coat/jacket I own. And no holiday look is complete without the right bag, right? This tassel clutch is classic in shape and color, but so on-trend with the added embellishment of the tassel. It'll go with so many other looks and I cannot wait to use it all season long! Oh, and I realize you can't see this because I forgot to photograph it, but there's a pop of pink on the inside of the clutch! It's such a fun surprise when you open it. Okay, I'll stop talking about this look because I literally have a gazillion photos in this post. 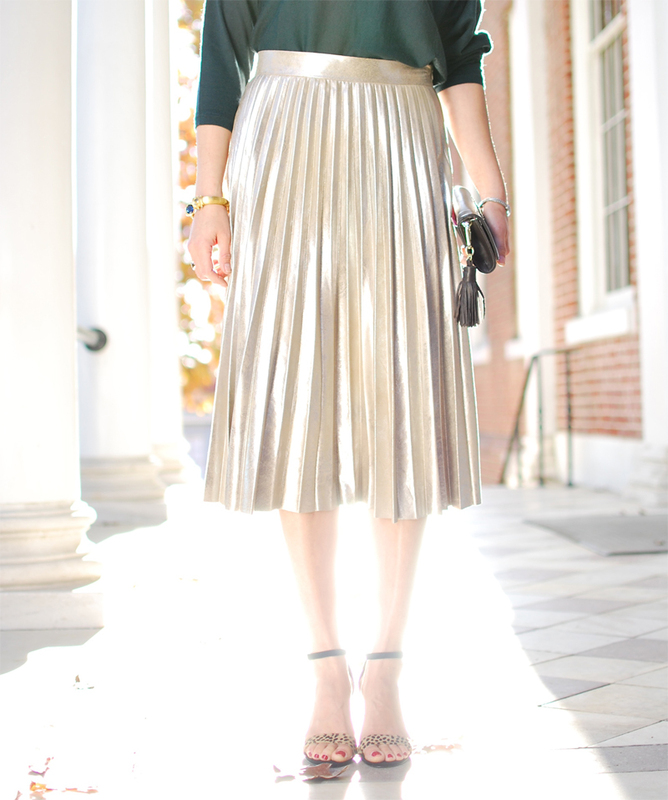 Quite possibly the longest outfit post I've ever done! Hope you all enjoy it! And for those of you traveling today, safe travels!! you look very beautiful ..Beyond words..Your dressing sense is fab..